Wha-hey, it’s another review for what Meowskivich is deeming the “Donkey Kong ExstravaLandsa”. It has a lot of As, so you KNOW it’s good. This time up is Donkey Land 2, which I purchased back in…March (I think?) when the Nintendo eShop was making a big deal about the newest Mario vs. Donkey Kong game that I don’t think was called that but it was built on the premise of the previous games. You see, I was already curious about the game, since I had DKL3 on the Game Boy since I was on the other side of the world, and I also wanted to get Donkey Kong Country Returns 3D. Also, I’m an avid fan of Donkey Kong Country 2. So, long-winded story short, the price of DKC Returns was more than getting DKL2 AND DKC Returns, so I got them both, and both were pleasing. But that was my initial reaction to the game—let’s see how I feel now. Which brings me to one of the very few problems I really have with the game: the music selection. Now, don’t get me wrong; the music in this game can pretty much be seen as “the best of DKC2 remixed into 8-bit monotone chiptune goodness”, but this tune…is used for the rest of the world until the boss. The game will keep reusing the same song for multiple levels in a row, which will make the songs lose their luster (except the Rattle Battle song; they don’t overuse that, which is good, but on the same token, I wanted to hear it more…). 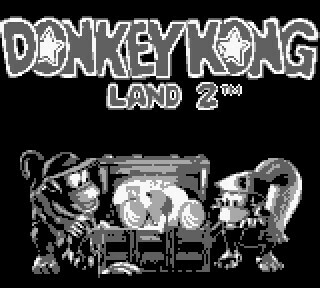 However, the rest of the game is pretty much an entire new level pack for DKC2, only in monochrome 8-bit, and lacking the ability to do “team up” abilities. This is great news for those who enjoyed the original, and especially for those who like the controls of the Country games, because gone now are the archaic choices from the first Donkey Kong Land. You collect bonus tokens to access the secret final world, you get DK tokens to get the best ending, and the end result is hours of entertainment—I got exactly 5 hours, according to my first save file. And I do mean EXACTLY. I can never erase this file. And before I forget, one of the problems of both DKL AND DKL2 is a weird mechanic where if you fall below the camera, you die (which happens easily in the first game, but is only noticeable on vertical stages in DKL2). With all this said, it’s a fairly solid platformer. I can easily recommend it to pretty much anyone looking for a good five-ish hours of four-color fun for three or four dollars or however much it’s going for these days. Join Meowskivich next time in “Donkey Kong ExtravaLandsa” for Donkey Kong Land III, a game from his childhood that he pretty much hasn’t played all the way through SINCE his childhood. Will it be good, will it be lame, or will it continue to scare him with some of the ridiculous challenges that helped harden him into the platforming world champion he is today?! Find out next…future! Same Meow-time, same Cola-channel!